Nearly being ran over seems to happen to Ben Simmons more than most, but it comes with the job of checking for bogus Blue Badges. One woman suspected of abusing a disabled badge decided to drive off when questioned by the enforcement officer almost hitting one of the them in the process. All this happened in Market Place car park in Banbury while being followed by the Banbury Guardian yesterday (Thursday, February 28) on one of the council’s regular operations to detect and prevent abuse of the Blue Badge scheme. When asked what he hoped to achieve, Mr Simmons said: “Education is one thing as people need to know how to use them properly as even people who have got Blue Badges rightfully they may misuse them without the intention. A source of frustration is the lack of power the officers have when they come across a Blue Badge abuser. The attempted drive-by was reported to police, but standard wrong-doers are referred to the council who decide whether or not to prosecute. They cannot force people to hand over badges, nor enter suspicious vehicles to check the licence, so the driver has to be there to be questioned, unlike car park attendants, which can mean a waiting game. But Mr Simmons thinks it is all worthwhile, even the potential injuries - he was assaulted last year - as people abusing the system is not right. "Disabled spaces are there for a reason and if people misuse that and people see they get away with it why shouldn't anyone park there and not pay and go shopping," he said. On patrol, officers came across two elderly ladies in a car in a disabled bay by NatWest who they want to ask about their Blue Badge. It all turned out fine, like most times. Both officers are former police officers and their detective skills are clear to see, anything can make them suspicious like a car parked slightly out of the bay. But mostly they wait until someone is with their car in a disabled space and politely ask to see their Blue Badge, most were happy to hand it over but a few were not. Hospitals, shopping centres and supermarkets were among the locations targeted across Oxfordshire and in Banbury yesterday, 200 badges were checked, with four removed for being out of date. Blue Badge misuse is a criminal offence and can result in a fine of up to £1,000 and a criminal record - a penalty charge notice will also be issued to anyone misusing a disabled parking bay. The operation was organised by Oxfordshire County Council, in partnership with Oxford City Council’s anti-fraud team and Cherwell District Council. County councillor Judith Heathcoat, who is responsible for Blue Badges, said: “People should be aware that we are determined to enforce the law in this area. “The Blue Badge system needs to operate with integrity and we are prepared to act to make sure it does. As well as removing Blue Badges from people who are misusing and abusing the scheme, the operation was used to raise awareness of the importance Blue Badges have for people who really need them. Many Banbury residents rely on their Blue Badge to remain mobile and independent, enabling them to access goods and services that many of us take for granted. The operation also targeted misuse of disabled parking bays. When a disabled bay is being used by someone who does not have a legitimate Blue Badge, this can have serious implications for those who genuinely need to use the space. Inappropriate use of disabled parking bays can result in Blue Badge holders missing medical appointments, not being able to get out to buy food, or get to work. Every space really does matter. 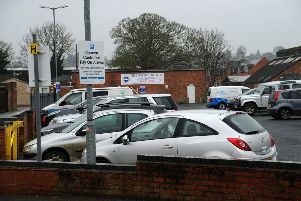 Cllr Andrew McHugh, Cherwell’s lead member for health and wellbeing, said: “It is vital that the right of people living with disabilities to park in allocated bays be respected and protected. Last month, the county council ran an amnesty for people to hand in any bogus or out of date Blue Badges, receiving 200. It is hoped that the amnesty and the enforcement will make people more aware that they should not be abusing the Blue Badge scheme. The councils are appealing to badge holders to return their old badges when they are issued with a new one or when the badge is no longer needed. If the badge holder has died or the badge is no longer needed, return it to County Hall in Oxford, or at any library around the county, or send it to: Blue Badge Service, PO Box 873, Oxford, OX1 9NY.